Lebanese Taverna is an outpost of the Arlington restaurant mini-empire that includes six restaurants and four cafés plus a market. I read good things about the place over the years and was happy that Baltimore now had its own restaurant. Now was the perfect time to check it out. The space is large and high-ceilinged, decorated in shades of brown and white. It's spare and modern (check out the long rectangular metal mesh lamps, below) but with ethnic touches such as the tiled wall at the back of the room and the beaded curtain that separates the main dining room from the bathroom area. Lebanese music (including some throbbing disco) was piped in at a nicely quiet level over the sound system. 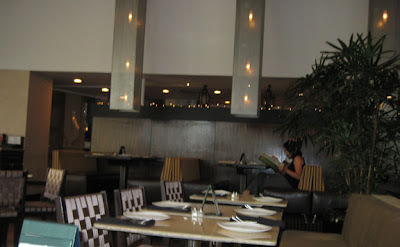 The one thing I found weird about the decor is the wall separating the dining room from the kitchen. You can't see it too well in this shot because of the glare, but it appears to be covered in brown wood grain-patterned Contact Paper, making it look like something from Dean Martin's living room, ca. 1972. It was early, and we were the only folks in the place for a few minutes as we perused the menu and decided to stick with the Restaurant Week offerings. We were brought a basket of freshly-baked pita breads and a little dish of olive oil with za'atar (a blend of herbs like thyme, oregano, marjoram, plus sesame seeds and salt. Sometimes Lebanese za'atar contains sumac, but I didn't notice any in this particular blend). 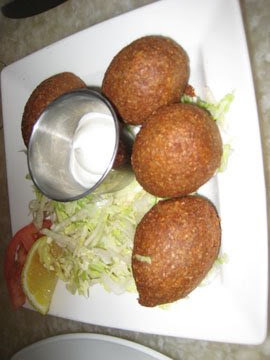 Mr Minx had the Kibbeh appetizer (ground beef and crushed wheat shells stuffed with ground lamb, beef, pine nuts and almonds) . The description made them sound like they would be little meat tarts, but instead they were meatball-like objects. They were crisp on the outside and tender and dry-textured inside, spiced with cinnamon and perhaps nutmeg. Served with very rich yogurt sauce, the four large pieces were almost a meal unto themselves. We both enjoyed them and I wouldn't mind attempting these at home. 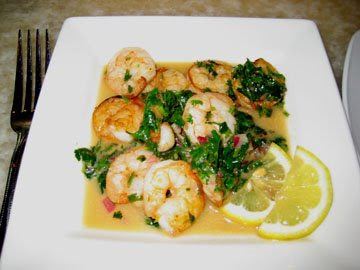 I went for the Shrimp Arak (shrimp sautéed with garlic, onion, cilantro, Arak). I was disappointed that I could not taste the Arak, a Middle Eastern anise-flavored liquor. Instead, the sauce was extremely tangy (but in a good way) and did not need those additional lemon slices. The shrimp tasted like they had been grilled before being sautéed with the sauce, which was a nice touch. 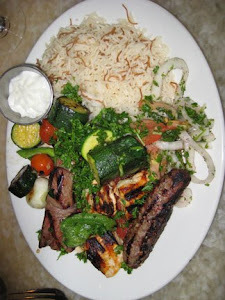 For his entrée, Mr Minx chose the mixed grill, a heaping helping of lamb, chicken, beef, and kafta skewers, onion salad, rice, and a ton of barely-grilled zucchini, pearl onions, and green pepper, all liberally sprinkled with fresh parsley. The chicken (breast meat) was a little dry, but everything else was tender and juicy, particularly the beef. I had the salmon meshwi, despite having had salmon the night before. 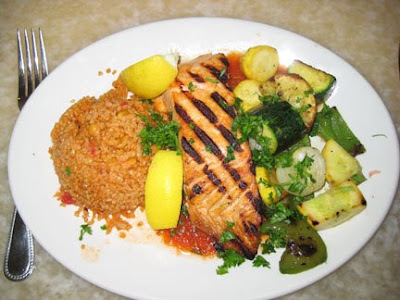 The difference between the Lebanese Taverna dish and mine was like night and day (my adventure with salmon will be chronicled later in the week). LT's was cooked to medium, enough to just melt the fat and render the meat tender and unctuous. I particularly enjoyed the crispy top layer. The salmon was served with couscous decorated with tiny chick peas (which I picked out since they tend to make me sick), a ton of grilled veggies, and a bit of tomato sauce. I loved it. 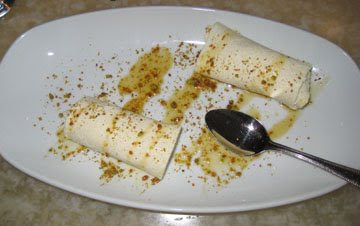 For dessert, Mr Minx had the Halawet Jiene, crepes stuffed with sweet cheese and sprinkled with finely ground semolina pistachio brittle and candied orange zest and drizzled with a honey-like sauce. Somewhat bland, it was also cool and refreshing after all of the grilled meat, and the brittle lent a crunchy counterpoint. 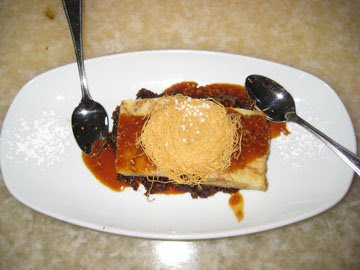 I liked it better than my dessert, warm "kaak" (a type of Arab bread) bread pudding with fig puree, sesame seed caramel sauce, and a disk of crispy katafy (a type of shredded pastry). The fig puree was more like Fig Newton filling - chunky and rich. The dessert was good, but a bit heavy for such warm weather. I think I would have preferred it with a thinner puree and a bit of ice cream or custard. For the amount of food they gave us, I'd say Lebanese Taverna was quite a bargain. And the flavors were excellent, so we'll definitely go back for more at some point in the future. I love that place. I used to shop at the Teeter next door. If you're near Pentagon City and into this cuisine, be sure to check Kebob Palace in Crystal City, not much to look at, but damned if they don't have the best kebobs ever. Plus, their chic-pea side dish is out of this world! I have never been- I have walked by a few times and peered in the window. It is on my list to try (which seems to grow everyday). Your comments on the place has bumped it up on the list! Thanks for the info on the Lebanese Taverna. I have been thinking of trying it!